In this Oct. 8, 2014, file photo, New England Patriots offensive coordinator Josh McDaniels, right, talks with defensive backfield coach Brian Flores as they walk out to the field before practice begins at the NFL football team's facility in Foxborough, Mass. It looked like the Patriots would be replacing both of their coordinators following February's Super Bowl loss to Philadelphia. McDaniels walked away from a deal to coach the Colts. But there will be a new look on defense, with Flores taking over play calling duties following defensive coordinator Matt Patricia's departure. FOXBOROUGH, Massachusetts — In his first public comments since he declined at the last minute to accept the Indianapolis Colts’ head coaching position, Josh McDaniels denied Friday that he’d made any deal to succeed Bill Belichick as coach of the New England Patriots. McDaniels listed several reasons for remaining in New England as Belichick’s offensive coordinator — some personal, some football-related. But he said his job is no different than it was before his near-departure for Indianapolis. That role will continue to be calling plays and working with quarterback Tom Brady. McDaniels and the rest of the Patriots’ assistants spoke to reporters at Gillette Stadium on Friday for the first time since New England’s loss to the Philadelphia Eagles in the Super Bowl on Feb. 4. The Colts thought they had hired McDaniels two days later, tweeting out a welcome and even scheduling a news conference for the next day. Instead, McDaniels, who was coach of the Denver Broncos from 2009-10, changed his mind and returned to the Patriots for his 10th season as offensive coordinator. “You know there’s a lot that goes into those things and it can be very complicated,” he said. “I’ve stated again and again that I definitely want to be a head coach again. At the same time, I love being here. 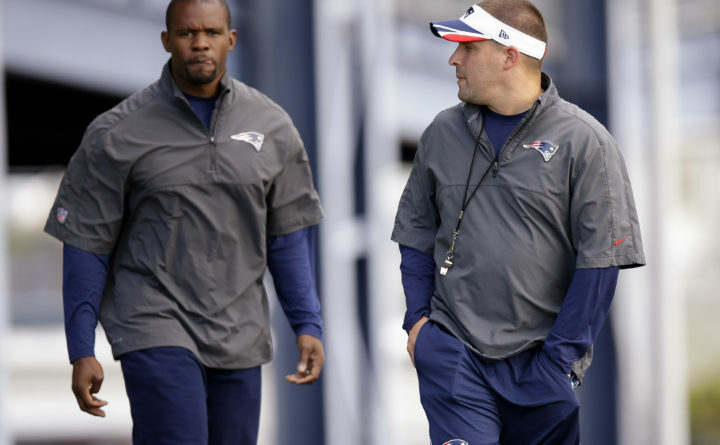 While McDaniels returns to his old role, linebackers coach Brian Flores’ duties will expand. Although he won’t have the title of defensive coordinator, Flores will call the plays. This isn’t a new situation for Belichick’s staff: Matt Patricia, who left to become coach of the Detroit Lions in January, called plays from 2009-11 before getting the defensive coordinator title in 2012. The Patriots ranked 29th in yards allowed per game (366) but were fifth in points allowed (18.5) last season. Flores doesn’t anticipate making a personal stamp on the defense just because he’ll be calling the plays.